Working with students in high school isn’t always easy. Most don’t want to be singled out and may feel like coming to speech is for little kids. I try to make an effort to get them to “buy in” even if it’s a tiny bit. One way to do this is to find interesting activities. Doing main idea worksheets over and over bores me, let alone my students. To keep things interesting I make the activity we’re doing into a game. I’ve found that students are much more interested if there’s a competition. A lot of my students are tech-savvy and really interested in technology, so finding games online is a great way for me to keep my students engaged. One website I love using has a computer game called Orpheus the Lyrical. 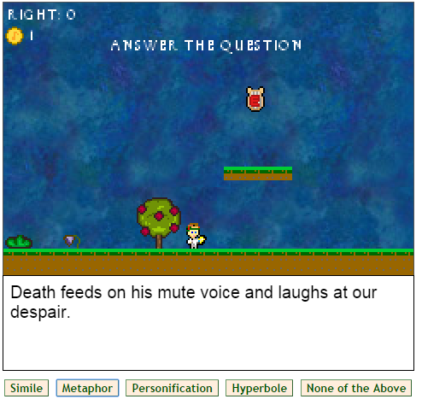 This game integrates figurative language questions into a video game format. The game based on the classic Greek myth of Orpheus and Eurydice, which is cool because you could use that to spin off into more activities (see below for ideas). Students play the game and when they run into obstacles, a questions pops up that they must answer before moving on. The students are given examples of figurative language and multiple choice options to label it (simile, metaphor, personification, etc.). Throughout the game the character gains different powers, and if the question is answered incorrectly, you lose some of the powers. I’ve been using it with two of my high school students who both have high functioning autism and they love it! I found this game on an awesome site called EReading Worksheets. This site offers TONS of free worksheets for kindergarten through high school. I love them because they cover a lot of the same language concepts I work with –main idea, summarizing, inferencing, and figurative language. Do you know any more great games like this? Let us know! Sign up for our mailing list here to stay updated with our latest therapy tips, app announcements, and blog posts. Don’t forget to follow us on Twitter, Pinterest, and like us on Facebook!